It's that time of year where lots of people are out straining themselves for good causes. 'BBC Children in Need' has a bunch of celebrities off climbing Mount Kilimanjaro... or is it mounting_ no, never mind. Even here, locally, there's a gang of fine folks about to climb our lovely mountain Croagh Patrick for seven days running. That's it in the picture and that dot on the top is a church) I mean seven days in a row, they're not actually running up it, though that's been done too. Am I the only one who thinks it's a pity that all the really good fund-raising activities have to be directly related to extreme physical activity? People run marathons, swim bodies of water and generally knock themselves out in the name of making a little dosh for good causes. I would like to join in and perhaps engage in an activity to raise some money for such things but, believe me, I ain't gonna make it the end of anything calling itself 'The Four Peaks Challenge'. Perhaps somebody could organise a 'Four Settees Challenge' where people are sponsored to sit on a variety of oversized soft furnishings for an extended period? I could give that a go. Or how about the 'Four Very Long Subtitled Foreign Movies Challenge' wherein the protagonists have to sit through... well, you get the idea. I want to help... really I do. I'm just not up to much at the moment. When someone puts a sponsor form in front of my nose, I'm not too bothered at to the physicality of the feat being attempted. I only want to know to where the money is going, and how much of it will actually get there. Had one the other day, of the jumping out of a plane kind of idea. There's a fine line between giving money to charity, and paying for someone's day out. The company that fly you up there and train you how to pull the rip cord of your parachute make a dent worth a couple of hundred bucks in the sponsor money. Even worse is the pay for my adventure holiday kind of charitable initatives, where it's a couple of grand worth of people's donations that pay for the flights and all the equipment you need to cycle up Mount Fiji or whatever else it is. Anyway, my point is, I'm always happier to donate to something like "sponsored sit on my arse all day" as I know all the money is going to charidee. How about the Sit on Someone Else's Settees Challenge? Pick three friends, and take it in turns to visit one another and sit on the settee - although most settees are only comfortably three-seaters, so it could be a bit of a squash. Hey, you're reminding me of MST3K--that would actually be fun as a group, forced to sit through endless b-movies or all 10,000 Last of the Summer Wine episodes, or whatever. When people donate to charities, it's the charity that counts, not the activity I think: look at people getting their heads shaved, for instance. One year I did NaNoWriMo for an autism charity, and asked people to donate whatever-cents they could for each page I finished. 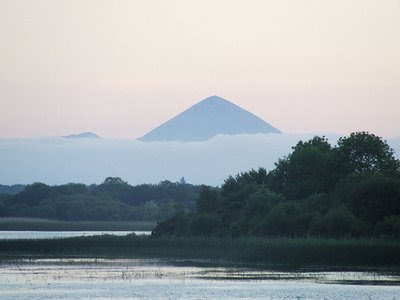 I climbed Croagh Patrick once...it was ENOUGH. I was scared to death at that last bit. While sitting on the settee [or crouching on the couch], perhaps we could makes lists of how charities could responsibly spend the money. Or at least request to see their plan. Move the sofa to their office and let us answer the phones. Stuff envelopes on an overstuffed lounge. I agree! I went to college at Penn State (Go Lions! ), home of the largest dance marathon in the country, perhaps the world. The dancers raise money for the 4 diamonds, which benefits kids with cancer. The event is grueling. Dancers dance for 48 hours straight. I think the longest break is 15 minutes! Even so, they have to turn people away every year! does sound a lot more attractive. How about a strenuous tele surfing event to,I don't know,save the Guinness Pint HA HA HA. I just realized how right you are. Every event for charity seems to be a 5k run or something. I don't know about your idea of sitting for dollars or whatever, but there must be some alternative to mountain climbing. Tam: Hope all is well with you mate! Catherine: Four on my settee would be a squeeze. Would we just sit or could there be talking and eating apple pie involved? Susan: I've only climbed The Reek once myself, to my shame - it's a great experience. Jon: Wow! Some man for one man. Just sitting around for charity sounds like a missed Father Ted plot. I think there would need to be pie or cake (I don't like apple pie) and a lot of talking involved though.